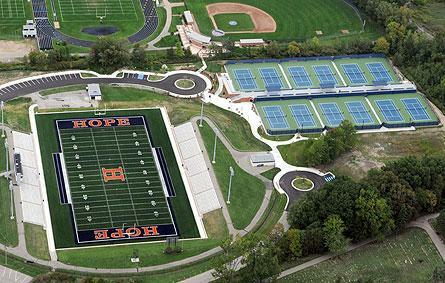 Two Hope College athletic facilities have gained national recognition from the American Sports Builders Association (ASBA). The Ray & Sue Smith Stadium and the Vande Poel-Heeringa Stadium Courts at the Etheridge Tennis Complex both have been selected category winners in the ASBA’s annual awards program, which helps promote the highest standards of construction by recognizing excellence in design, construction and renovation in the sports facility industry. The Ray & Sue Smith Stadium, Hope’s home for football, topped the Single Field category, while the Vande Poel-Heeringa Stadium Courts won the Outdoor Tennis category. Both projects will compete for the ASBA Facility of the Year award that will be announced in December. The ASBA is a national, non-profit organization for builders, designers and suppliers of materials for tennis courts, running tracks, synthetic turf fields, and indoor and outdoor synthetic sports surfaces. Architectural design for Vande Poel-Heeringa Stadium Courts was by GMB Architects and Engineers of Holland, in consultation with Alex Levitsky of Global Sports and Tennis Design Group of Fair Haven, N.Y. The construction manager was GDK Construction of Holland. GMB Architects were the design architects for the renovations to Ray & Sue Smith Stadium. The 5,322-seat Ray & Sue Smith Stadium will be dedicated on September 14 during Hope’s first home football game of the 2013 season, also the annual Community Day. The college purchased the former Holland Municipal Stadium from the city of Holland in 2012 and renovated it. Artificial turf replaced the grass field prior to the 2012 season. Smith is Hope’s all-time winningest football coach with a 148-69-9 record that included nine Michigan Intercollegiate Athletic Association (MIAA) championships. Smith is one of two MIAA coaches to win nine league championships. The 12-court, outdoor Vande Poel-Heeringa Stadium opened in 2012 and are located east of Ray & Sue Smith Stadium. The facility, which also includes elevated seating for spectators, is designed for competition, instruction and casual play alike. The Vande Poel-Heeringa Stadium Courts were made possible through many generous gifts, including from the families of former Hope doubles partners Earle Vande Poel ’35 and George Heeringa ’36, for whom the facility is named.